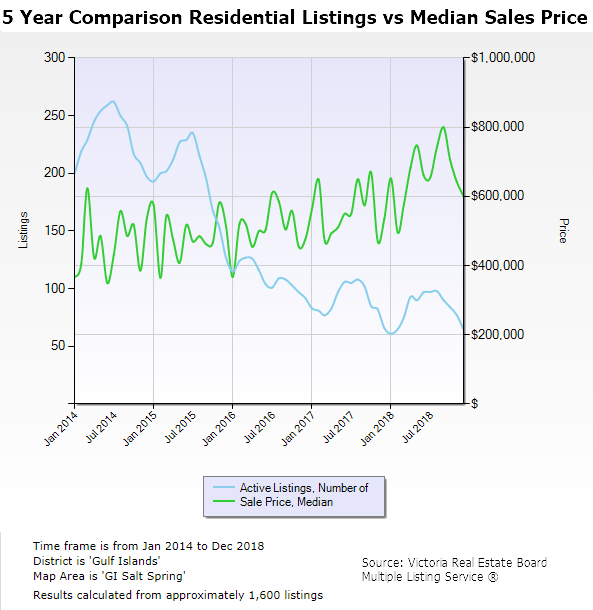 Overall 2019 should be a steady year but sellers might have to sharpen their pencils and be less aggressive and more flexible with their prices. The buyers should have more time to look at all the listings in their price range and face a lower probability of multiple offers. There will be a good selection of homes at the high-end. 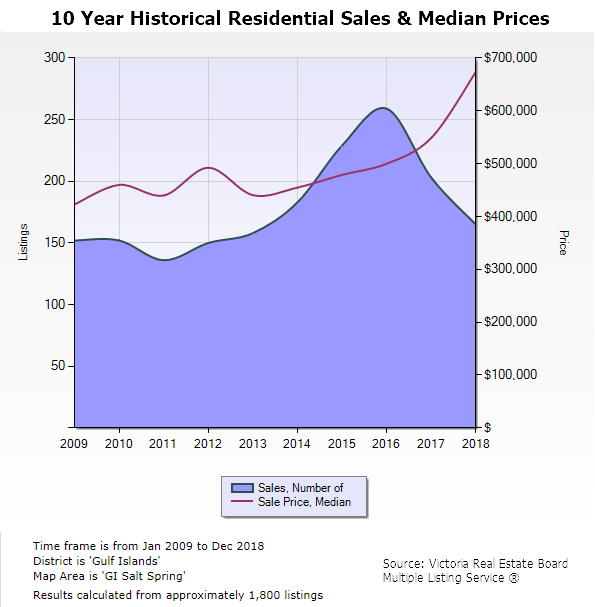 The middle market is the most active with decent homes being found in the 600k to 800k range homes in this range typically need a cosmetic update. The low-end sub 500k is almost non-existent on Salt Spring at this time. The construction boom on Salt Spring that started in 2016 will continue for the foreseeable future. The construction boom has brought lots of young construction workers to the island who have rented all the rental homes and bought up most of the homes under 500k or so. 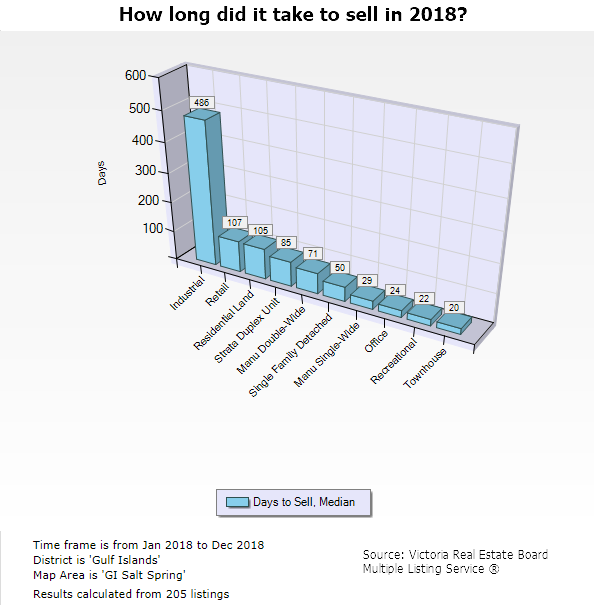 The main source of buyers on Salt Spring in the last few years has been the Vancouver area but in 2018/19 the Vancouver market has slowed. 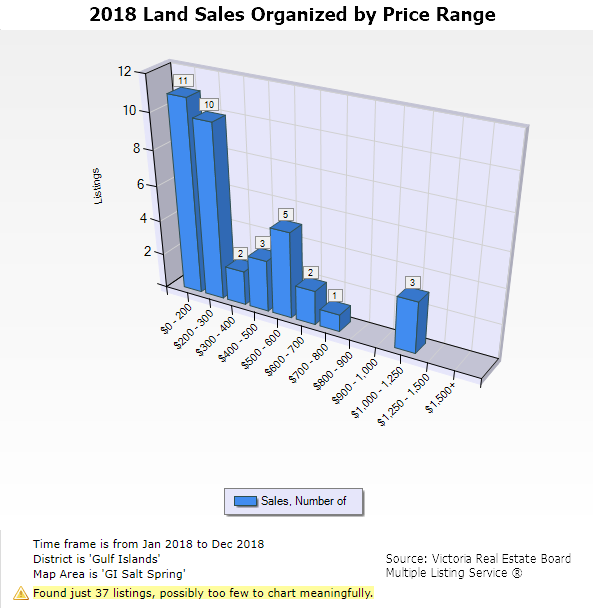 The 20% foreign buyers tax will limit the number of US buyers who typically make up around 10% of the market on Salt Spring. Since 2014, we have seen fewer purchasers from Alberta, which had been about 20% of our traditional buyer’s pool. 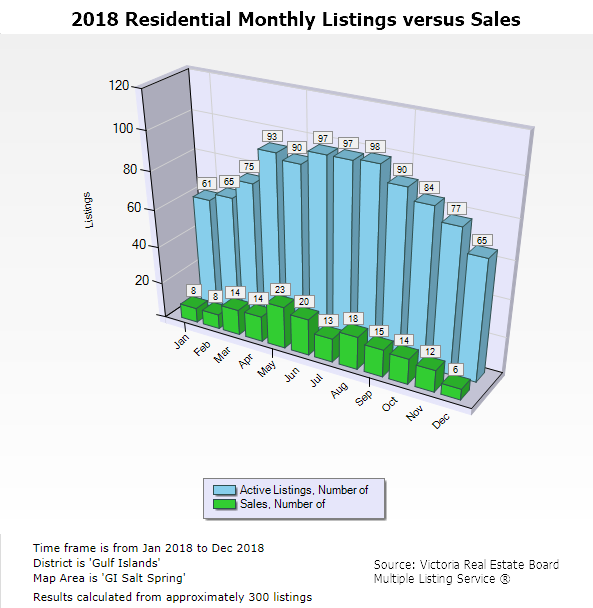 If you have any questions about Salt Spring Real Estate don’t hesitate to call, text or email me. Here is a summary of 2018 in chart and graph form. 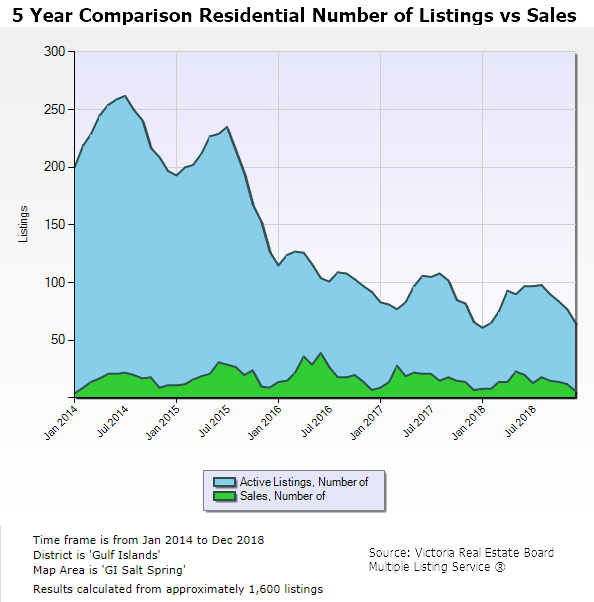 Salt Spring Island real estate was a buyers’ market from late 2008 (financial crash) until spring/summer of 2015. The low of the market was probably 2012/13. 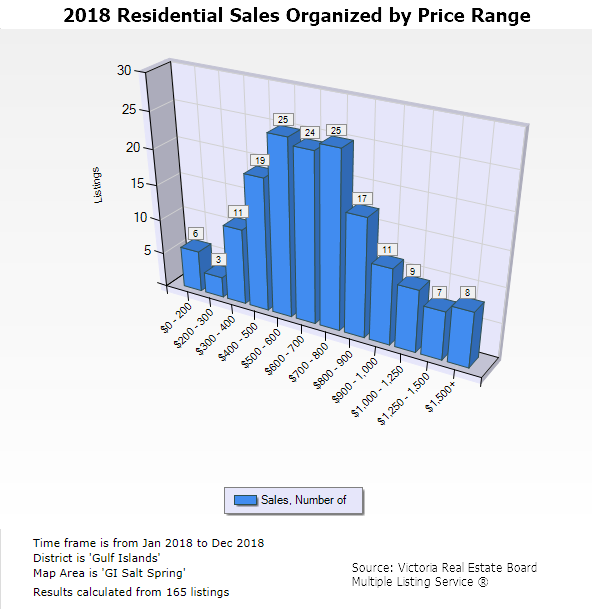 Since 2015 Salt Spring has been a sellers’ market with prices trending up. 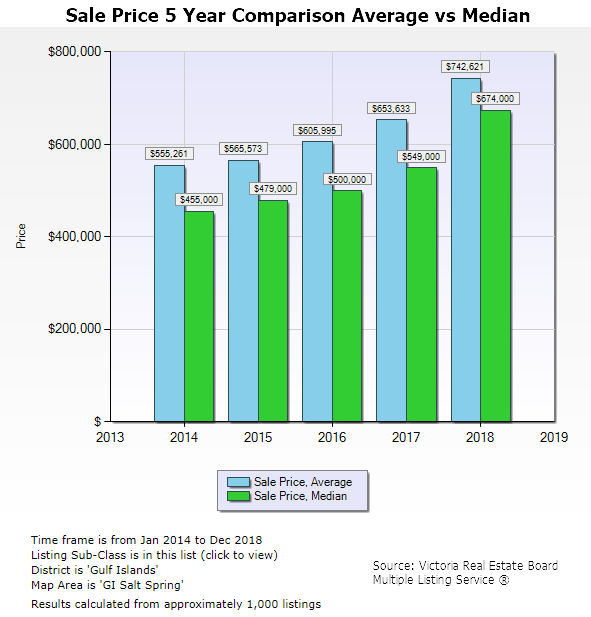 We have used median values when possible. It is the middle value which means ½ the numbers are below and ½ are above the statistic given. The average value is different. To calculate the average you add all the values together and divide by the number of values. Here is a graph that shows how different the results are. 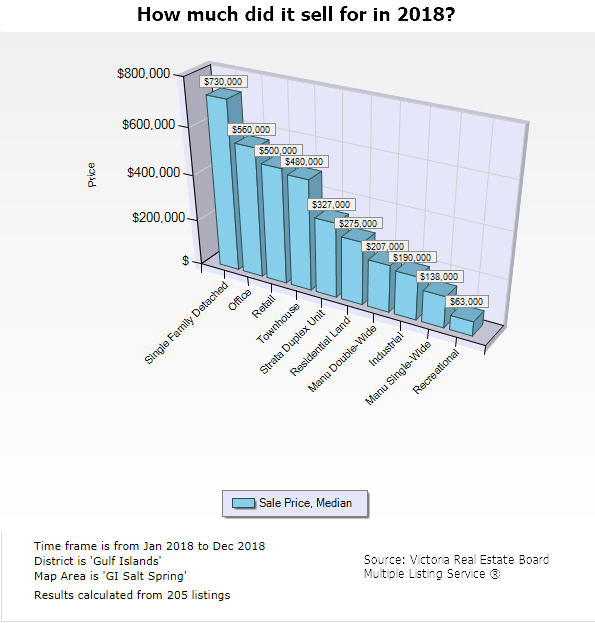 The Victoria Real Estate Board Multiple Listing Service ® is the source used for these statistics. 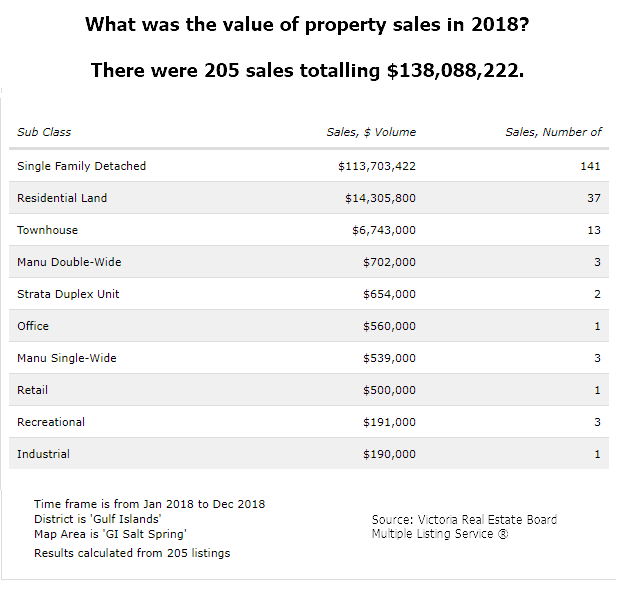 The total numbers might be slightly different due to private sale and sales on other Boards. 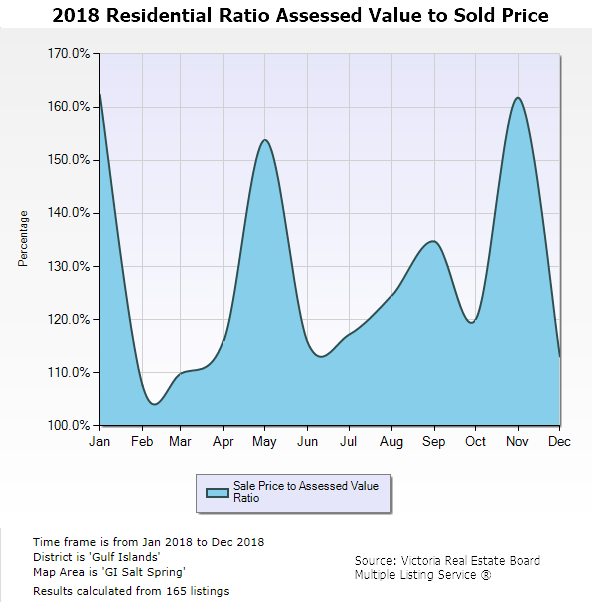 If you are wondering why the Salt Spring BC Assessment value is sometimes very different from the listing or selling price, there are a few reasons. Most of the properties are unique and work is sometimes done without building permits. One of the many reasons why working with a realtor who knows the market is important.